Click on images to see larger versions and to read the original magazine text describing the prints. Walking Dresses were worn on outdoor occasions when one wanted to see and be seen. They are often referred to as Promenade Dresses, a very literal definition of their purpose. 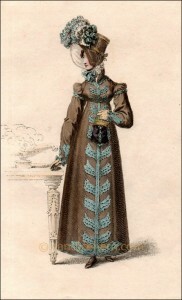 The fashionable Regency woman was seen walking in the parks or in the shopping districts during the London Season (spring and early summer); at the popular seaside resorts in August and September; and in the countryside at their own estates or at house parties during the fall and winter months. As they publicly promenaded with other fashionable people, they wanted to look their best, showing off the latest styles, the newest colors, the trendiest accessories. And they used the fashion prints in ladies’ magazines, as seen here, to keep abreast of changing fashions. In fact, the magazines often made note of changes from the previous month, so the truly fashionable had to pay close attention. Because they were meant to be worn outdoors, the full costume of the Walking Dress always included a head covering of some kind, an outer garment or wrap, and gloves. Depending on the season, various outer garments were integral to the walking costume. The short spencer jacket, coming only to the waist of the dress, just below the bosom, can be seen in Figures 1, 2 and 7. As waistlines rise, so does the spencer. (By the way, the spencer jacket is named after the 2nd Earl Spencer who is said to have singed the tails of his coat when standing too close to a fire. He cut the tails off, and started a new fashion of short coats for men. Regency ladies, with their high waists, took the short coat idea to its extreme.) The longer pelisse can be seen in Figures 1, 3, 4, 6 and 8. Only Figure 4 shows a three-quarter length pelisse. As most of the prints in my collection show full-length pelisses, one must assume that it was the more popular length. An artfully draped shawl is shown in Figures 5. Fabrics for outwear are dependent on the season. Velvets and wools are prevalent for colder months. Sarsnet and kerseymere are prevalent for warmer months. 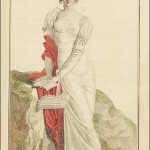 Although the dress beneath a full-length pelisse or long cloak cannot be seen in the print, the dress is usually described in the magazine, as many modistes would have made the dress and pelisse as a set. The dresses are almost always white. 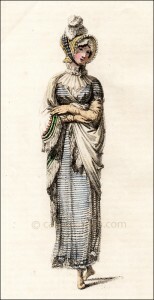 After about 1812, more color and pattern is seen in the dresses, as in the striped sarsnet shown in Figure 5. In the early years of the century, through about 1803, the skirts are still quite long, covering the tops of the feet, and often including a demi-train. 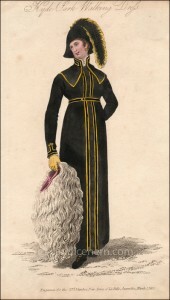 The earlier prints in my collection, many of them French, show that, in general, the hem lengths shorten and trains disappear for walking dresses by about 1805. 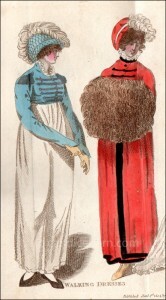 Figure 1, an English print from 1804, shows the new shorter length hemline. By 1810, the silhouette for all types of dresses becomes slightly more narrow as the fullness of the skirt, once gathered all the way around the waist, is drawn to the center back, producing a full back and flatter front. During the years 1813-1815, the hemlines are a bit shorter, as seen in Figures 5 and 6, allowing a good view of half-boots or sandals laced up the ankle. Embellished hemlines become more prominent starting around 1814, and by 1816 the deep, ornate flounces seen in evening dress and morning dress appear in walking costumes not only in the dress but in the full-length pelisse as well. The gradual transition from Classic styles to Gothic styles was seen in all elements of women’s fashions. 1816-1818 is a period of fashionable excess. Dresses and outerwear are decorated as never before. No amount of embellishment is too much. Cord, ribbons, tassels, lace, ruffles, bows, artificial flowers, embroidery — everything in abundance. The simple, classical lines of a decade earlier have all but disappeared beneath the weight of ornamentation. The sleeves of spencers and pelisses are fuller and longer in this later period. Compare the tight sleeve of Figure 3 from 1810 to the looser sleeve of Figure 8 from 1818. The sleeves in Figure 6, 7,and 8 all fall below the wrist to almost completely cover the hand. The cuffs of sleeves are embellished with braiding, embroidery, and other trim, and the shoulder is given more emphasis with added trim of cord and lace, even when there is no epaulette. Gothic ornamentation is in full bloom. Throughout most of this period, England was at war with France, and a quasi-military style often crept into women’s fashion. In Figure 1 from 1804, the figure on the left is said to be wearing a “Military Spencer.” Note the lacings across the chest, in imitation of regimental tape lacings, and the silver epaulettes on the shoulders. 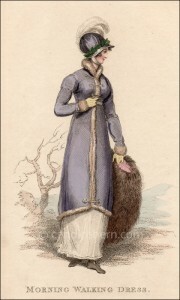 Her companion wears a pelisse with a similar military look. The pelisse in Figure 3 has a strong military flavor, more for it’s stark, almost masculine cut than for any specific military trimming. The helmet-shaped bonnet in Figure 4 also has a military flavor. The general use of epaulettes and frogging throughout the period also suggests a military influence. Spencer jackets and pelisses often buttoned high on the neck, so that the dresses and chemisettes underneath sometimes had high standing collars to display above the outerwear. Ruffles, lace, and vandyking abound in the bits of collar allowed to show. Ruffs were popular throughout the period — some modest and some huge — and can be seen in Figures 1, 2, 5, and 7. 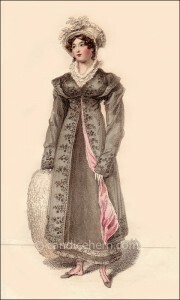 Bonnets, caps, and veils were worn to cover the head, and were often the means of the most dashing or frivolous fashion statement. Note the large plumes on the bonnets in Figures 1,3,4, and 5. Or the use of laurel leaves in Figure 4. (Though none of these prints happen to show bonnets with artificial flowers, they were a very popular embellishment, especially after about 1812.) Notice also in the accompanying magazine texts (click on images to see those) that hats and bonnets sometimes get more detailed descriptions than the dress, indicating the importance of head gear. Bonnet crowns rose to new heights in 1814-15 and that height continued to some degree, arriving finally at the enormous poke bonnet in Figure 8 from 1818. Not only is the poke huge and the crown high, but it is topped with two large plumes and an elaborate ribbon bow. For the most part, however, height was not everything. The concern seems to have been for showy decoration more than anything else, some of it quite ridiculous to a modern eye. I have a print that shows a bonnet adorned with ears of Indian corn on the bonnet, and another with a full cornucopia of fruit. The walking costume also lent itself to a wonderful assortment of accessories. 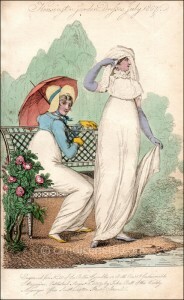 Only Figure 2 shows a parasol, but that was a very common accessory in prints of walking dresses. Huge fur muffs were also popular. Figure 1 shows a brown bear muff, Figure 3 an Angola muff, Figure 4 a silver bear muff, Figure 6 a “Britannia pearl fur” muff, and Figure 7 a swansdown muff. 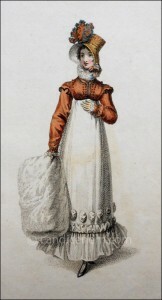 Prints of walking dresses also show a reticule now and then. Note the metal-framed black reticule in Figure 8. Though jewelry was more plentiful and grand for evening wear (for example, gemstones would seldom be worn during the day), there were nevertheless various items appropriate for day wear. The standing woman in Figure 2 is wearing gold hoop earrings, as is the woman in Figure 3. Hoop earrings were popular throughout the Regency period. Though there is not much jewelry shown in this selection of prints, other prints of walking dresses show quizzing glasses on long gold chains, or watch fobs attached with a chain at the waist. Alison Adburgham, Women in Print: Writing Women and Women’s Magazine from the Restoration to the Accession of Victoria, George Allen and Unwin Ltd., 1972. Irene Dancyger, A World of Women: An Illustrated History of Women’s Magazines 1700-1970, Gill and Macmillan, 1978. Jody Gayle, Fashions in the Era of Jane Austen, Publications of the Past, 2012. Madeleine Ginsburg, An Introduction to Fashion Illustration, Victoria & Albert Museum, 1980. Vyvyan Holland, Hand Coloured Fashion Plates 1770-1899, Batsford, 1955. Doris Langley Moore, Fashion Through Fashion Plates 1771-1970, Clarkson N. Potter, Inc., 1971. Sacheverell Sitwell and Doris Langley Moore, Gallery of Fashion 1790-1822, Batsford, 1949. Cynthia L. White, Women’s Magazines 1693-1968, Michael Joseph, 1970.